Mrs Chymera briefly welcomed the Torch before asking Cllr Howard Middleton, the Lord Mayor of Bradford to speak on behalf of the City of Bradford Council. The Lord Mayor praised the contribution the Ukrainian community had made to the city’s sporting and cultural life before expressing concern about the general ignorance of the facts of the Holodomor amongst the city’s residents. He noted with some sorrow the tragic and horrendous deaths by starvation of at least 7 million Ukrainians. In particular, he expressed sympathy for those who had survived the horrors of the Famine of 1932-33 and hoped that the burden of their terrible personal memories could be eased by sharing an increased awareness of the victims and knowledge of this tragedy. The Lord Mayor stated that the Torch would leave Bradford with the acknowledgement of the people of Bradford of the victims of this massive tragedy in the history of Ukraine and their support for international recognition of the Holodomor as an act of genocide. Mr Viacheslav Yatsiuk, Counsellor in the Embassy of Ukraine in London, presented a statement on behalf of the Ambassador. This was followed by a statement from Mr Askold Lozynskyj, President of the World Congress of Ukrainians. 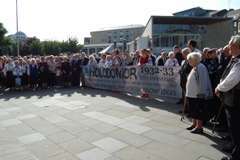 At this point, Miss Pylak invited Mrs Vera Smereka, a survivor of the Holodomor, to address the people gathered around the Torch and a Holodomor banner. Mrs Smerka spoke movingly of her survival as a 9 year old in the Sumy region of Ukraine. Her survival was largely the result of the love and care of her mother. She spoke graphically about surviving on meals of boiled weeds, only made palatable by the addition of sorrel leaves the search for which frequently required walking many kilometres. She spoke of her childish delight in finding white strawberries in an area of cleared forest. She provide harrowing detail of how her mother would feel her fingers every night before bed hoping not to find any signs of swelling which were the first signs of eventual death. Mrs Smereka’s eye witness account clearly moved many in the gathering. After the presentations a procession formed behind the Torch and the Ukrainian national flag. 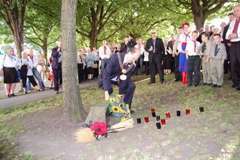 The procession walked to the “Ukrainian Grove” on the edge of the city centre. The procession was led by Very Rev Mychajlo Hutorny, a survivor of the Holodomor, who carried the Torch. 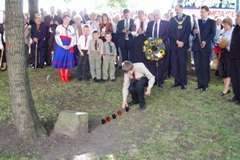 In the Grove representatives of each of four generations of Ukrainians resident in Bradford placed alternate black and red candles in the shape of a cross before a plaque put in place in 1983 to commemorate the Holodomor. This was followed by the laying of wreaths by the Lord Mayor (comprised mainly of blue cornflowers and yellow sunflowers) and by Mrs Chymera (comprised of a wheat sheaf and a dark red poppy). The Very Rev Hutorny with the support of Rev Chomiak and Rev Yakubiak spoke a prayer in memory of those who perished during the Great Famine. The evening was completed in the City Hall where those gathered were able to view the Holodomor Exhibition brought to the House of Lords in May 2008 by President Victor Yushchenko. Whilst people were studying the exhibition materials the Bradford mixed choir, the Youth Association’s girls’ choir and the Krylati dance troupe performed Ukrainian songs and folk dances to celebrate the survival of Soviet purges by Ukrainian traditions and culture. Finally before returning to London Mr Yatsiuk spoke more personally about how he had first learnt of the horrors of the Holodomor as a 4 year old on the knee of his grandma. He also spoke eloquently about the significance of the tragedy of this artificial famine in shaping the outlook of the Ukrainian nation and of how imperative it was that the tragedy of the Holodomor was never forgotten and of securing international recognition of the Holodomor as an act of genocide against Ukrainians as a national and ethnic group. The Bradford Telegraph & Argus newspaper was present and published articles about the Holodomor Torch before and after the event.